Rohde & Schwarz Mobile Network Testing offers the best video quality test solution (in line with ITU-T J.343.1) running on state-of-the-art smartphones, the only solution recommended by ETSI test specification 102 250-2 for all types of video services. It analyzes spatial and temporal details to determine the picture quality and includes meta information from the IP stream / header. Video streaming services, both video on demand and live video services, have rapidly become the most popular use case for mobile phones. These services are enabled by highly efficient compression algorithms, rapidly expanding bandwidth (particularly in mobile networks) and, of course, by powerful end-user devices with brilliant high-resolution displays. Subscribers massively enjoy third-party applications, known as over-the-top (OTT) media services. Typically, an application client that is located on the smartphone connects to an application server that is out of the MNO’s reach. Consequently, MNOs have no direct control over third-party apps such as YouTube, Netflix, etc. How to manage the video traffic that drives the data explosion in mobile networks? The vast majority of the traffic in mobile networks today comes from video services (> 60%). Cisco VNI Mobile forecasts that mobile video will grow to 78% of all mobile traffic by 2021. Consequently, the user's perception of video service quality has an increasing impact on overall user satisfaction and the operators’ success. How to test your own video services vs. OTT applications from third parties? The most popular video services today are OTT services (e.g. YouTube, Netflix, Hulu, etc.). If you want to know how OTT applications are performing in your network, then you should use precisely those applications to conduct tests and measure the perceived quality of experience (QoE). Social media services are starting to offer video services (e.g. Facebook, WhatsApp, etc.). Mobile network operators are also starting to offer their own video services (often live video services). Rohde & Schwarz Mobile Network Testing can provide the most reliable way to measure the QoE of the video applications and the quality of the network using e.g. the Network Performance Test (capacity and coverage). Video services are very popular and so is their use today in various services and media. YouTube and Netflix are merely the pioneers in video streaming; many other services have followed. Broadcasting stations move more and more content online, videos are shared via social media, and peer-to-peer applications are on the rise; for example, video chat services (e.g. Skype), or the private broadcasting of live captured videos (e.g. Periscope). But what’s their visual quality like? In previous entries of this blog series about the challenges of mobile video services, we discussed video quality as a perceived metric, how it can be measured, and how quality measuring algorithms work. To conclude the series, this post focuses on how to apply a video quality measure to quantify video services as consumed by subscribers. What are the challenges and what are the results telling you about your network? In this post, we will take a closer look at automated video quality measurement methods, often called objective measurements, which are applied in real field video quality measurements. Learn more about how to master the challenge of testing the quality of experience (QoE) of video services in mobile networks. The webinar examines the importance of user perceived video quality for operator success and how to test the user's perceived quality of experience (QoE) of video services (live streaming or video on demand). Arnd Sibila, technology marketing manager, explains the growing importance of video quality in mobile networks, and the limitations that mobile operators face to control this quality that is dependent on the network resources and how these resources are allocated. Arnd Sibila, technology marketing manager, explains how to measure the real network performance, capacity and coverage, as perceived by end-users. In the video, Arnd describes the scope of tests performed and what parameters to consider in making these tests. The video series explains how objective methods and algorithms, such as MOS, J.343.1, etc., are used to measure the subjective nature of video quality in a mobile network. 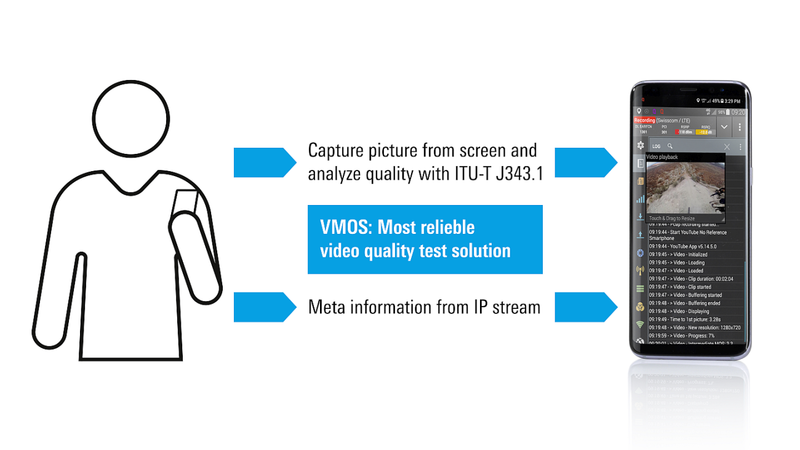 It show in detail how video quality can and should be tested using J.343.1. As a very robust algorithm, J.343.1 takes into account all video characteristics into a single score; e.g., coding, compression, rescaling artifacts, perceived freezing, etc. Videos are the most popular web content and have long formed the bulk of data volume in mobile networks. Which is why not only video consumers but also video service providers and network operators have a vested interest in a high quality experience. Mobile measuring systems assess this automatically just as reliable as human viewers. The application card summarizes in a compact 2-page-format all the important facts concerning about video quality testing in mobile networks. The whitepaper consists a detailed description of all aspects that affect video services (from delivery strategies for video services to protocol info via video codecs, compression and technical background information to QoE testing for video services and test solutions.